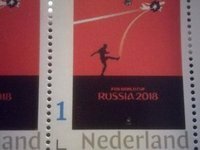 PostNL, the national postal operator in the Netherlands, has printed stamps showing the connection between the World Cup in Russia and the MH17 disaster in 2014, Ukraine's Yevropeiska Pravda online newspaper has reported, with reference to Dutch website NOS. The stamp depicts a man who knocks down the plane in the air with the ball. Below is the text "FIFA World Cup Russia 2018." The author of this image is Ukrainian artist Andriy Yermolenko. He made a series of eight similar posters about the World Cup in Russia, demonstrating the bloody nature of the Russian regime. Yermolenko has provided free access to his posters and anyone can download them on the Internet and use for printing products. The stamps were ordered on the PostNL website, where anyone can design and order stamps with a personal image. The company confirmed that an order for a sheet with ten such stamps had been made.